Football season is here! We are definitely football fans in this house. Our two youngest boys both play tackle on the local youth football league, and even my daughter is getting in on the action playing in the powder puff game at homecoming. Then, I had an assignment for Disney to make some gingerbread cookies (sorry, can’t say anymore about that), and only used a portion of this FABULOUS soft gingerbread cookie dough I found. 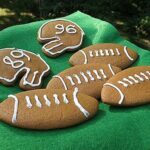 I have never really liked gingerbread, well at least I didn’t until I found this recipe. :) Roll it fairly thick and you’ll have deliciously soft and chewy gingerbread. 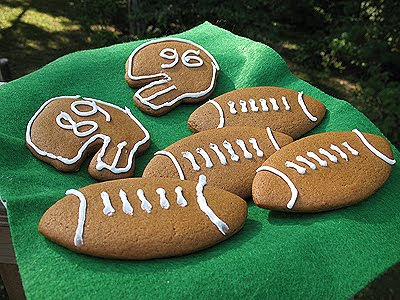 So anyway, I needed to use up the remaining dough, so I dug through the cookie cutters and decided to make the boys a helmet each with their numbers on them, some footballs, and played around with the rest, making some gingerbread people, ghosts, and pumpkins. I found the recipe on Recipezaar and absolutely agree with the title. Some people had a little trouble with the dough being sticky, but I followed her directions exactly, including the part about letting the dough rest for at least two hours and had no problems at all. I didn’t make the second batch of cookies until the next day. I had chilled the dough in the refrigerator overnight and took it out in the morning and let it come to room temperature before rolling it out. In a large bowl (KitchenAid's great for this) beat butter, brown sugar, and egg on medium speed until well blended. Add molasses, vanilla, and lemon zest and continue to mix until well blended. Gradually stir in dry ingredients until blended and smooth. Place 1 portion of the dough on a lightly floured surface. Sprinkle flour over dough and rolling pin. Roll dough to a scant 1/4-inch thick (I rolled mine a bit thicker for softer cookies). Use additional flour to avoid sticking. Cut out cookies with desired cutter. I actually found it easier to roll the dough out on the parchment, cut out the cookies and remove the outer pieces, leaving the cookie shapes on the parchment. Then lift the parchment up at one side, so that the cookie shape is now upside down, place your hand under it and peel the parchment off the back of the cookie. The cookie will land gently in your hand and won't get stretched out of shape like it would if you lift the cookie from the surface and place it on the pan. Space cookies 1 1/2-inches apart. Bake 1 sheet at a time for 7-10 minutes (the lower time will give you softer cookies). Remove cookie sheet from oven and allow the cookies to stand until the cookies are firm enough to move to a wire rack. I am so happy gingerbread is still here :) Adorable cookies Amanda! Such a cute idea! My kids would have a ball helping with these. Hope they like them Ingrid! I love baking for kids! For the most part that are always thrilled with whatever baked treat you give them! I'm gonna steat, er borrow your idea and do it for my son's football team! Thx! those look wonderful and simply perfect! Amanda….GOD BLESS YOU! All day long I've been thinking what kind of cookies can I make with the gigantic maple leave pancake mold/cookie cutters I got at a yard sale last Saturday? My gosh, I think you just gave me the answer! 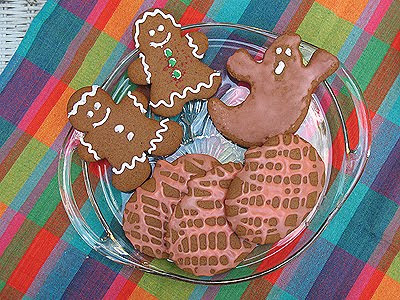 I wanted a nice soft gingerbread cookie because spice says fall to me…………..I can't WAIT to try these!!! Thanks Bridgett, they were a big hit with the boys! Katrina – I agree, autumn has so many great flavors! Yum! All the autumn yumminess is making me excited that it's finally fall. That and the beautiful cooler weather! 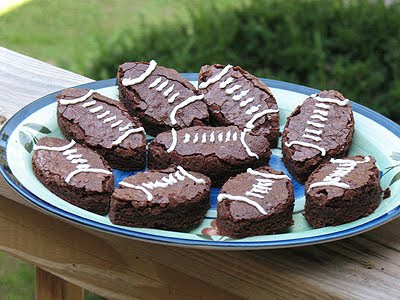 These look fun and de-lish, Amanda!